The New Zealand IHC Foundation funded-project, led by Dr Daphne Rickson from Victoria’s New Zealand School of Music, explores the potential of music therapy for 10 New Zealand children with ASD. Families may be closer to discovering the genetic causes of intellectual disabilities affecting their children thanks to a University of Auckland research project being funded by the IHC Foundation. The camps are sponsored by the New Zealand Williams Syndrome Association and some funding for this year’s event was donated by the IHC Foundation. he Move Tutor Training Scheme has been running for four years and the IHC Foundation has been delighted to support this innovative programme since it began. 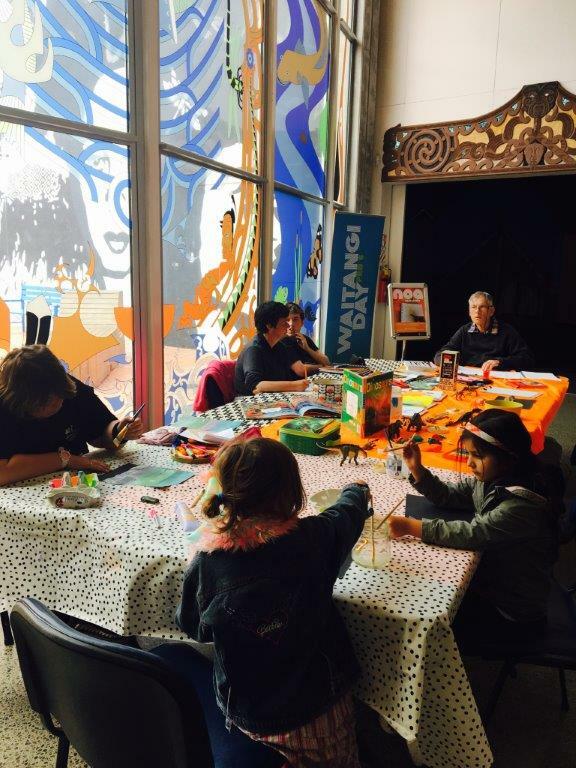 A group of artists has taken up residence in the foyer of Te Manawa museum in Palmerston North to share their creativity with each other and with visitors and tourists alike. They are part of NOA Open Studio, which opened towards the end of 2016 with funding from the IHC Foundation. It is one way in which the museum, art gallery and science centre is bringing the life of the community inside the building. Chief Executive Andy Lowe says Te Manawa has a concept called ‘museum without boundaries’. “It’s about mixing it up and breaking down the barriers. We want to bring people who are often invisible and make them visible in our environment,” he says. He says the IHC Foundation funding had “put wings on an idea” by enabling Te Manawa to really explore what it means to be inclusive. NOA Arts Facilitator Aroha Lowe, his wife, has had a long involvement with outsider artists, with artists who have disabilities, with the elderly and with children. She says NOA is about sharing and inhabiting public space to create art together. “The right of citizenship means that we can move through public spaces. We are part of things that go on. Te Manawa is funded by the ratepayer and anyone can come here, but some people have been under-represented,” she says. “I was raised by my father who was disabled. He was seriously injured in a traffic accident when I was three – hit by a vehicle when he was walking across a crossing in Auckland. My mother had died of cancer just months before this. So, my father, post-coma, had to learn to talk and walk again. “He was my hero, in that everyday, just-my-Dad kind of way, and I learned a great deal from him about bravery as he struggled through what was largely difficult terrain for a disabled father. We used to visit galleries, museums, shops etc before there were wheelchairs and other supports available,” she says. Aroha says NOA stands for Notes Of Art. Noa is also a Māori word that can mean open, safe or free from restriction. “In Te Ao Māori, through powhiri, karanga, karakia and whaikorero, we use ritual to establish safety, to allow for each other’s difference and to find common ground,” she says. The sessions are mixed ability and for all ages. “It’s about whoever is here on the day. People come in with clear ideas and it might be a very solitary experience. Other people come in and see who’s here and it might be a very organic thing,” she says. Also welcome are tourists, kids with their grandmas or caregivers, known and emerging artists, and visitors waiting for exhibition queues to clear. When the north-westerly winds are blowing, the sailors from Sailability Wellington head for the shelter of Porirua harbour. No one wants to miss a day’s sailing. YouthLaw released its report Challenging the Barriers: Ensuring Access to Education for Children with Special Educational Needs in September 2016. In 2015, the IHC Foundation provided funding to Interacting Theatre to run the InterACT2015 – a three-day disability arts festival showcasing performances, classes and workshops in Auckland. Two dance works exploring limitations, scale and physical boundaries, were staged this year by a dance company devoted to giving disabled people the chance to dance at a professional level. Rather than keeping artwork within the confines of the gallery, in 2015 Studio2/the Margaret Freeman Gallery branched out. The IHC Foundation supported the Travel Safe Guide - A guide to being out and about for people with intellectual disability. " Music makers and their audiences made some rare connections at two accessible concerts run by Chamber Music New Zealand this year. They did it without a concert hall, or evening dress, or any of the other trappings of classical music. Recent research stresses that beyond marginalization, disabled refugees are invisible to disability services and to the rest of society, compounding an already difficult resettlement experience in New Zealand. Stories from families that have navigated disability services are the only source of meaningful help we can provide to them. The Big Event took place on 5th & 6th April 2013, having been made possible through the very generous assistance of the IHC Foundation. We can truly say that it was the biggest expo of its kind in New Zealand. Ninety exhibition stands plus a huge Youth Section showed new products and services, as well as offering visitors new experiences. A fully curated Art Exhibition called “Perspectives” was a great draw card with all the exhibits being produced by artists with disabilities. The Sensory Space gave people the chance to experience their senses and the Innovation Corner showed examples of adaptations to make life easier. An entertainment programme added a great sense of joy to the atmosphere. Quite apart from the benefits for the general public, the benefits of networking and collaborating for the providers and exhibitors were immeasurable. There were many families that attended and many people with intellectual disabilities took advantage of the expo. Comments on the value of being able to meet such a lot of service providers under the same roof and at the same time were common. The grant enabled us to meet some of the expenses in the Youth Section for which a number of high cost pieces of equipment were hired. This enabled young people to experience new activities in a safe, fun way, While extending them physically and intellectually. l have attached copies of some of the accounts. Overall, we feel we achieved our objectives in promoting the concept of inclusion and were able to demonstrate the benefits of working collaboratively. The support of the IHC Foundation was hugely valued and we were very pleased to be able to recognise it at both the opening and closing events, as well as with the banners that were displayed in the foyer. We also ensured the logo was printed on the visitor handout.